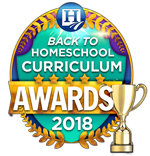 Yesterday, we published Part I of the Back to Homeschool Awards. The companies are listed alphabetically – and we published A-F.
Today we have G- U (there is no Z). If you missed yesterday’s blog, you can read the entire list here. Gregory is an author of children’s books, including Bob on the Job, CAT is Where it’s At, and Deere is Right Here! He has also written Chemistry game books, Favorite King James Bible Verses and Passages, and an autobiography (dealing with illnesses and setbacks; surmounting them and showing the power of God in our lives). The company offers monthly History Boxes your children will love. Each box contains hands-on crafts, lessons, reading materials, and more! Choose your time period and dive into Ancient History, the Middle Ages, or American History. History Unboxed can be used as a stand-alone history curriculum or in harmony with your existing curriculum of choice. Their FAQ page answers any questions you might have. 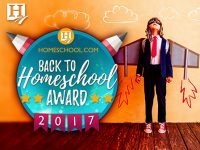 Homeschool.com, the #1 homeschooling community on the internet, is your go-to resource for everything homeschooling, for beginning-advanced homeschoolers. 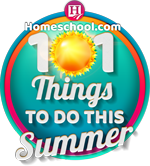 These resources include newsletters, blog posts, podcasts, product reviews, Top 10 lists, homeschooling events and so much more. HUE HD provides colorful, affordable technology to inspire creative learning and teaching. The HUE HD Pro document camera; the HUE Animation Studio – a stop motion movie making starter kit; and the HUE Tablet stand are ideal for any homeschooling curriculum or classroom. With PlayTape, kids create instant roads for toy cars anytime, anywhere. Sticks to any flat surface, easy to tear, repositionable, leaves no residue, easily stored & transported, and it’s disposable and recyclable. Just unroll, stick, and drive! K12 is a leading provider of individual online courses from PreK – 12, designed to strengthen core skills, recover credits, or accelerate studies. 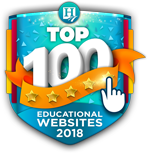 Providing both independent courses as well as courses supported by world-class K12 teachers, K12 offers hundreds of flexible, award-winning courses to support your child’s education. Easy sign up for Fall 2017! The Keystone School is a flexible, accredited online private school for Grades 6-12, that helps students achieve their unique dreams and goals. Whether your student wants to study full-time or just needs individual classes, Keystone offers more than 170 courses from credit recovery to world languages and AP. Students can enroll at any time – and it’s easy to sign up for Fall 2017! The Best E-mail for kids! Spam free, ad free and Kids Email will give you peace of mind while your kids stay connected to family and friends! Try it FREE today! Math practice made smarter. Knowre is an award-winning online program for Pre-Algebra, Algebra 1, Geometry, and Algebra 2. They support your child’s math practice with thousands of questions, interactive step-by-step support, and instructional videos. 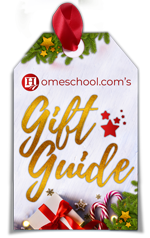 Perfect for your 2017-2018 homeschooling endeavors. Mathletics is an online math learning space for K-12 students. Their comprehensive curriculum is leveled to the student’s grade and can easily be amended to meet abilities. Printable workbooks included at no extra charge mean students can take a break from the screen and still learn. You can check out their FREE math printables, plus get a FREE Trial to both Mathletics and their sister site, Spellodrome here. Improve one grade level in reading in 20 hours. Dramatic results, guaranteed! Oak Meadow provides flexible, creative homeschooling curriculum for kids K-12. Their experiential, nature-based approach allows families to set their own rhythm of learning and encourages critical thinking and intellectual development. Use Oak Meadow independently or enroll in their teacher-supported, accredited distance school. You can start anytime. Sign up now for Fall 2017. Reading Kingdom teaches children 4-10 to read and write with comprehension at a 3rd grade level. It is the first program that uses the 6 Skill Integrated Method. Additional programs are available for older students and children with autism. You can see sample lessons here. Award-winning ShillerMath is an open-and-go, zero lesson prep, Montessori based math curriculum with a multi-sensory approach. No Montessori or math knowledge is required – just read the scripted lessons, and you’re good to go! Sample lessons are available on their site (under Mostly Free Stuff). Teach My provides award winning learning kits for babies, toddlers, preschoolers and kindergarteners. From ABCs to 123s, your mini scholar can master the basics in just 20 minutes a day. Plus, the company offers bathtime fun, educational yoga mats, flashcards, and MORE. Christian, K-12 online, accredited, teacher and parent led, comprehensive programs or single courses, 300 multimedia rich course catalogue. LearningByGrace.org offers many options to fit your family’s needs, including easy payment plans. You can check out sample lessons here. For a homeschooling program tour click here; and this link will take you to a FREE Homeschool Consultation. Give Your Family a God-Filled Homeschooling Experience. Where reading essentials and a love for reading meet! The founder started writing her own curriculum because she couldn’t locate existing curriculum rigorous enough for her students’ needs. Soon, homeschoolers discovered the curriculum, asked to purchase it, and The Reading Corner was born. The site offers packages, year-long curriculum, and of course, sales items. Time4Learning is an award-winning, online curriculum for PreK-12th. Their learning system teaches and grades lessons, tracks progress, and works with a variety of learning styles. The comprehensive curriculum includes lessons in math, language arts, science, social studies and more. Students also have access to printable worksheets and the ability to advance at their own pace. Time4Learning combines the technology kids love with the education they need to make learning fun. Time4Writing offers 8-week online writing courses and a variety of free writing resources for 2nd-12th grade students. The student-paced courses include lessons and quizzes, and personalized feedback from certified teachers. From the basics of grammar to essay writing, Time4Writing is designed to help students master the art of writing at all levels. Courses are $99 each, and start daily. Up-Words® Reading is a comprehensive, research-based, 4-level reading program complete with everything necessary to teach every child to read – including literacy-rich activities to strengthen phonological awareness, phonics, fluency, sight words, and reading comprehension. We Love the Back to Homeschool Season. Don’t You?